ESD 12 Soldering Stations Easy monitoring of entire workplace - WX station acts as the digital controller for all units RS232 connection cable for controlling the pre-hea- ting plate and the fume extraction units Digital and optical decoupled interface for SPS (e.g. robot applications) USB interface Only 1 Controll Unit per Workbench Hard to believe, but TRUE: This Weller workbench solution will save as much power as a single-person household uses in a whole year! Highly Efﬁcient Benchtop Soldering Solutions The all-in-one professional soldering and energy-saving solution includes the new WX 2 dual- channel soldering station complete with WXP 65 intelligent soldering iron, the Zero Smog 4V solder fume extractor and a WHP series preheating plate. Compared to a conventional repair workstation, it is possible to save up to *1800 kWh per year. The WX 2 acts as a central control unit for the entire benchtop: the intelligent soldering irons, solder fume extractor and the preheating plate. When the soldering iron is not in use, the WX 2 switches all connected devices to Stand-by or Auto-off mode thereby signiﬁcantly reducing energy costs. 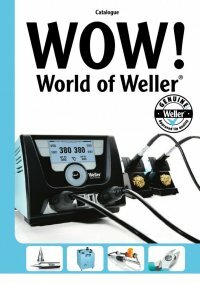 *Savings based on customer experience with a WeIler soldering system is in use on average for one hour per day for 220 workdays per year.